The Frontalasca breed (or Frisa Valtellinese) comes from Frontale in Val Rezzalo (Alta Valtellina, Province of Sondrio – Lombardia). 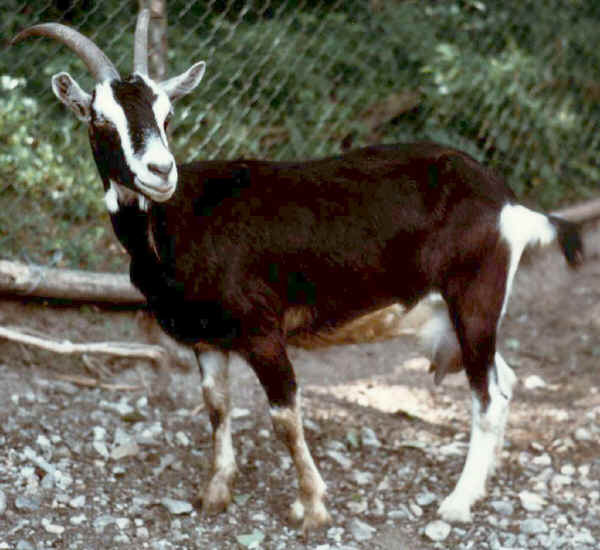 It is similar to the Swiss Grigionese breed, it is reared in Valtellina valley, Val Malenco, Val Masino, Valchiavenna). Black coat with characteristic white steaks at the sides of the head, bosom, sub-caudal area and at the limbs toes. Medium length thick shiny hair; long sabre-shaped horns. A dairy breed, it is reared for meat as well. A typical by-product is “Viulìn de càvra de Ciavéna” from salted spiced thigh and shoulder, aged for 2-3 months.